Everyone knows one of the greatest things about Portland, Oregon is their abundance of street food carts. According to FoodCartsPortland.com, Portland has over 200 food carts available at any given time. As a city that strives to continually provide fresh produce, especially in the summer months, it seems only natural that a vegetarian street food cart would exist. Aren’t we all a little vegetarian in the summer? It was a warm spring day when I visited. People were wandering around this block on SW 3rd Avenue (between Washington and Stark) trying to decide what to have for lunch. There were a few people in front of me, but I only waited about 10 minutes to eat. I liked that this cart also offered call in orders – perfect for the busy person who can barely escape for even 30 minutes during their workday. The menu was mostly soups and sandwiches with plentiful vegan options. 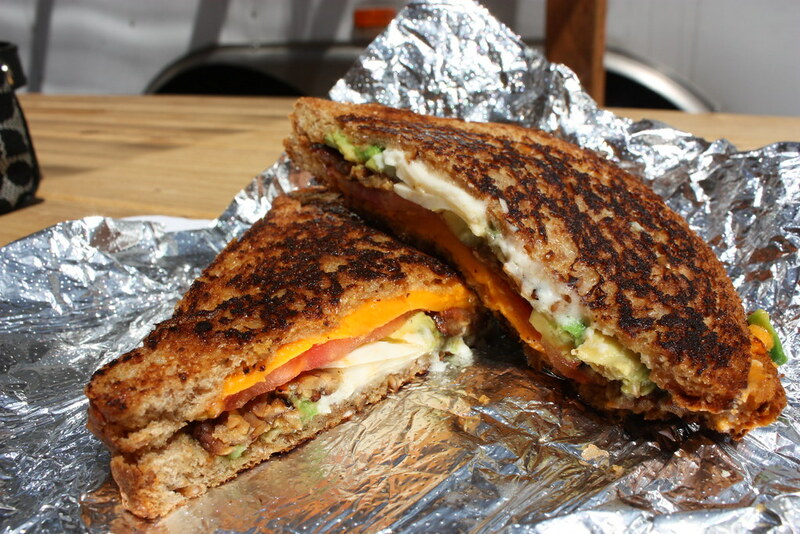 I opted for the vegan grilled cheddar cheese with tomato, vegetarian bacon and avocado. The cost was $4.50. There were a few picnic tables available, so I sat outside and enjoyed this tasty sandwich. It wasn’t as light as I would have preferred, but it was delicious! The vegetarian bacon added the perfect amount of crunchiness to an otherwise soft, yet crisp, sandwich. I also may have hit up a group of food carts in another area later that night and devoured some of the most decadent macaroni and cheese I’ve ever tasted, but there is no photographic evidence of this, so did it actually happen?